Disentangling the relationship between management practices and productivity has been hampered by the absence of large sample data across plants and firms. This column exploits a new survey covering US manufacturing to show that management practices vary both among and within companies. Furthermore, management practices are just as important for productivity as a number of other factors associated with successful businesses, such as technology adoption. Large-scale data on management have been virtually non-existent, at least until recently. As Syverson noted in his 2011 round-up of the evidence on what drives productivity: “no potential driver of productivity differences has seen a higher ratio of speculation to actual empirical study [than management]”. Case studies and small sample analyses can provide useful anecdotes, but don’t generalise to the broader economy due to a narrow focus or unrepresentative samples. To address this lack of data, we teamed up with the US Census Bureau to collect data from a large scientific sample of businesses. The Management and Organisational Practices Survey contained 16 management questions in three main sections: monitoring, targets, and incentives. We believe these three functions are the core of what business schools and consultancies claim is the essence of management. Together, we refer to monitoring, targeting, and incentives practices that are explicit, formal, frequent, and specific as ‘structured management practices’. Our survey was nationally representative but limited to manufacturing, covering small and large firms across every state in the US. And with a response rate of almost 80%, it covered plants that account for more than half of all US manufacturing employment. As a result, the survey is genuinely representative of US management practices. In total, we obtained data from over 35,000 manufacturing plants in this large national survey. Importantly, the Management and Organisational Practices Survey can be linked at the micro level to several other Census Bureau surveys allowing us to measure the impact of management practices on key measures of business performance such as productivity. The public remains divided over the value of management quality. But what do the data tell us? We find that the use of more structured management practices is positively correlated with firm performance (Bloom et al. 2017). In fact, variation in management practices can account for as much, or more, of the variation in productivity as a number of other factors associated with successful businesses, such as technology adoption. We summarise the intensity of adoption of structured management practices by creating an index of the responses from the 16 questions in the survey. An index of one represents the adoption of the most structured management practices (those with an explicit structured focus on performance monitoring, detailed targets and strong performance incentives). An index with a zero value represents the adoption of the least structured management practices. We find enormous variation across plants in their adoption of structured management practices. 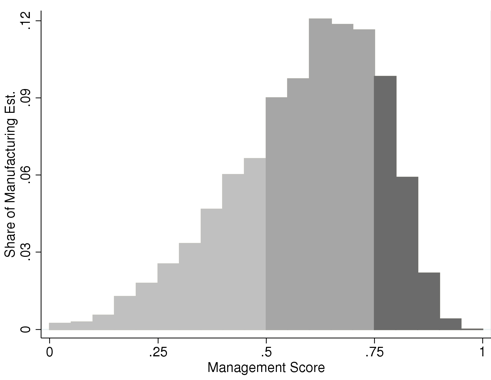 Figure 1 plots the histogram of plant management scores from least structured (0) to most structured (1). At the upper end, 18% of establishments have a management score of at least 0.75 indicating that they adopt 75% of the most structured management practices. However, notice that 27% of establishments adopt less than half of the structured management practices. Note: The management score is the unweighted average of the score for each of the 16 questions, where each question is first normalised to be on a 0-1 scale. The sample is all Management and Organisational Practices Survey observations with at least 11 non-missing responses to management questions and a successful match to the Annual Survey of Manufacturers, which were also included in Annual Survey of Manufacturers tabulations, and have positive value added, positive employment and positive imputed capital in the Annual Survey of Manufacturers. Figures are weighted using Annual Survey of Manufacturers weights. While we found that only one-fifth of plants use three-quarters or more of the performance-oriented management techniques that we asked about, these plants had dramatically better performance than plants that adopted less structured practices. To start, Figure 2 provides a non-parametric view into management practices and six performance metrics. The figure shows a positive and broadly monotonic relationship between structured management and productivity, profitability, growth, exporting, research and development (R&D), and patenting. Note: The management score is the unweighted average of the score for each of the 16 questions, where each question is first normalised to be on a 0-1 scale. The sample for panels 1, 2 and 4 is all Management and Organisational Practices Survey observations with at least 11 non-missing responses to management questions and a successful match to the Annual Survey of Manufacturers, which were also included in Annual Survey of Manufacturers tabulations, and have positive value added, positive employment and positive imputed capital in the Annual Survey of Manufacturers. The sample in panel 3 is similar to panel 1, but also conditions on non-missing total value in the 2005 Annual Survey of Manufacturers. The sample for panels 5 and 6 is similar to panel 1, also conditioning on non-missing R&D or patents requests count in the Business R&D and Innovation Survey. Management deciles are calculated using 2010 management scores for all panels. The deciles are re-calculated for the different samples. The figures are unweighted. This graphical representation is confirmed by regression analysis that shows that plants employing these monitoring and incentives-based management practices are far more productive, innovative and profitable. Every 10% increase in a plant's management index is associated with an impressive 14% increase in labour productivity, meaning higher value added per worker. Companies with higher structured management scores are also more likely to expand and less likely to go out of business. We also compared the impact of management approaches with more traditional explanations of business performance, including R&D, information technology (IT) expenditures, and workers' skill levels. We examined differences between plants at the 90th percentile of the productivity distribution and those at the 10th percentile to see what explained the difference. Our results suggest that structured management techniques explain 18% of that difference. By contrast, R&D accounts for 17%, employee skills for 11% and IT spending for 8%. In other words, management matters as much or more than the most common explanations for performance. Perhaps most surprisingly, we found that management practices varied not just among companies, but also within them. We found that over 40% of the variation in management practices among plants belonging to multi-plant firms was because of differences across establishments within the very same firm. That is, inside many large firms we found some plants utilising a highly structured approach to management alongside those with unstructured approaches. And this variation was greatest in the largest firms, possibly because standardising practices across regions and divisions is particularly hard for the biggest companies. What could cause these huge differences in management practices across establishments? We found several major factors. First, establishments in more competitive industries (measured by the Lerner index) adopt more structured management practices. Second, those in more pro-business states (proxied by states with ‘right to work’ laws, as in Holmes 1998) tend to use more structured management practices. Third, establishments with more college graduates and firms located near universities (building on the work of Moretti 2004 for identification) tended to adopt more structured management practices. Fourth, being located near a successful large new entrant (using the ‘million dollar plants’ identification strategy of Greenstone et al. 2010) is correlated with more structured management practices, likely because it allows local companies to learn about practices from these large, successful firms. All these factors matter, but they explained less than half of the variation in management techniques, which means that many other factors matter, too. One hypothesis is that individual managers and CEOs themselves are another critical driver (e.g. Bandiera et al. 2017). The bottom line of our research is that management matters a lot for company performance, and with the huge variation we see across manufacturing plants this suggests there are many opportunities to make big improvements in performance. Increasing management structure can be relatively cheap compared to investments in R&D or IT. While this study focused on US manufacturing, related work using the World Management Survey (www.worldmanagementsurvey.com) shows this huge spread of management practices is evident in other sectors like retail, education and healthcare, and even more striking in firms in Europe, Asia, South America, and Africa. Building on the research using the World Management Survey and the Management and Organisational Practices Survey, other countries are now developing their own surveys similar to the Management and Organisational Practices Survey (including Japan, the UK, Mexico, Pakistan, Germany, China, and Australia). With surveys that have some standardised features, cross-country comparisons will be more informative. Within the US, the informative results from the first wave of the Management and Organisational Practices Survey led to a second wave of the survey for 2015, which added sections on data driven decision making and uncertainty. In addition, the US Census Bureau added a topical module on management practices to the 2015 Annual Survey of Entrepreneurs, which covers 290,000 firms across most of the private, non-agricultural economy. As the data come in from these various endeavours, we hope to better understand what drives management practices and their relationship with productivity and growth. Bandiera, O, S Hansen, A Prat and R Sadun (2017), “CEO behaviour and firm performance”, Harvard mimeo. 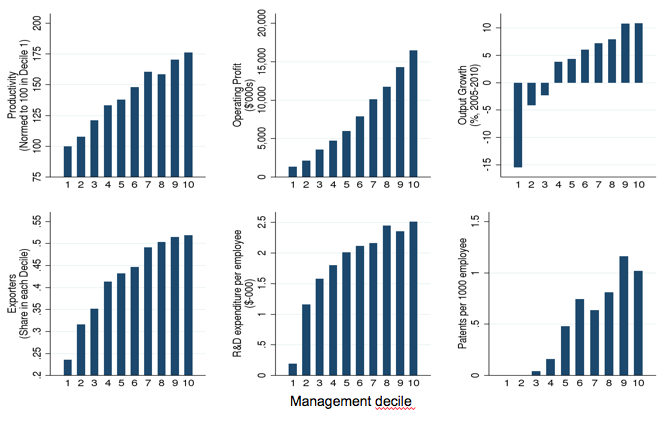 Bloom, N, E Brynjolfsson, L Foster, R S Jarmin, M Patnaik, I Saporta-Eksten and J Van Reenen (2017), “What drives differences in management?”, NBER working paper 23300. Buffington, C, L Foster, R S Jarmin, and S Ohlmacher (2016), “The Management and Organisational Practices Survey (MOPS): An overview”, Center for Economic Studies working paper No. 16-53. Holmes, T J (1998), ‘’The effect of state policies on the location of manufacturing: Evidence from state borders,’’ Journal of Political Economy 106(4): 667-705. Greenstone, M, R Hornbeck and E Moretti (2010), “Identifying agglomeration spillovers: Evidence from winners and losers of large plant openings”, Journal of Political Economy 118(3): 536-598. Moretti, E (2004), “Estimating the social return to higher education: Evidence from longitudinal and repeated cross-sectional data”, Journal of Econometrics 121 (1–2): 175-212. Syverson, C (2011), “What determines productivity?”, Journal of Economic Literature 49(2), 326-365. Syverson, C (2004), “Product substitutability and productivity dispersion”, Review of Economics and Statistics 86(2): 534-550.